The massive young stellar cluster Westerlund 1 (Source: Wikipedia, 2MASS/UMass/IPAC-Caltech/NASA/NSF) contains a large number of massive and hot stars. The size of the cluster is about 1'. 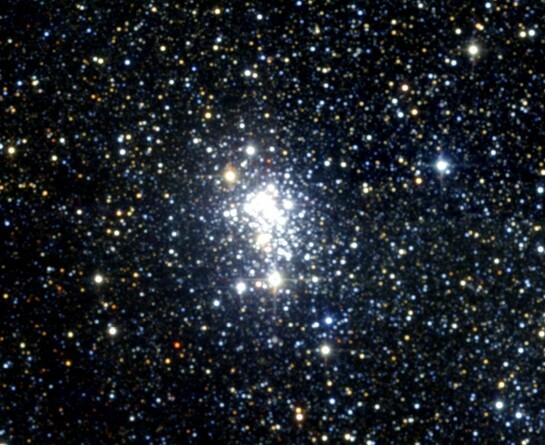 Westerlund 1 (Wd1) is the most massive compact young star cluster in our Galaxy, with a total mass of around 60000 solar masses, at a distance of 4 to 5 kpc from Earth. The cluster contains a large number of rare, evolved high-mass stars including 6 yellow hypergiants, 3 red supergiants, 24 Wolf-Rayet stars, as well as more than 80 blue supergiants (see e.g. Muno et al. 2006 for further references). With an estimated age of ~5 Myrs, the most massive stars in Wd1 will have evolved into supernovae, accelerating cosmic rays in their supernova remnant shocks. Winds of Wolf-Rayet stars and their termination shocks may also contribute to particle acceleration, dissipating an energy around 10^39 ergs/s. Massive young star clusters are therefore plausible sources of very high energy gamma rays, with the cluster Westerlund 2 as a first example (SOM 12/06). The Westerlund 1 region was observed with H.E.S.S. in 2004-2008 during the Galactic Plane Survey and by dedicated pointed observations, resulting in a total of 34 h of high-quality data. These data reveal a spatially very extended emission region of very high energy gamma rays, detected as a source with high statistical significance, centered roughly on Westerlund 1 (Fig. 1). In total, about 2300 gamma rays are detected. The extension of the emission exceeds 2 degrees in diameter (Fig. 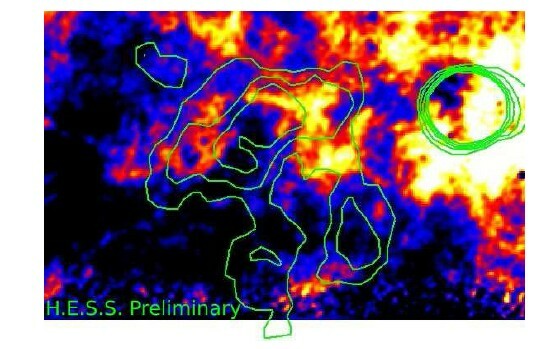 2), making it one of the largest structures observed in VHE gamma rays so far. Identifying the exact origin of the gamma-ray emission is difficult. For example, a pulsar wind nebula created by the pulsar PSR J1648-4611 might contribute, but is unlikely to account for the full extended emission. Radio data (Fig. 3) show evidence that Westerlund 1 is embedded in a (partial) bubble in the ambient medium, and the very high energy gamma ray emission overlaps with the edge of the bubble, where particles accelerated in wind termination shocks and supernova shocks might find a suitable target to interact and produce gamma rays. Fig. 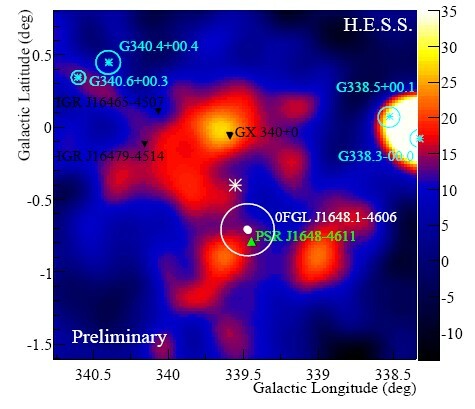 1: Gamma-ray count map of the region around the Westerlund 1 star cluster (here marked by the white cross). Note that the gamma ray emission extends well beyond the cluster, which is essentially point-like compared to the 0.1 degr. resolution of the H.E.S.S. instrument. Other interesting objects in the region are indicated, including the pulsar PSR J1648-4611 and the Fermi high-energy gamma-ray source 0FGL 1648.1-4606. Preliminary H.E.S.S. data. Fig. 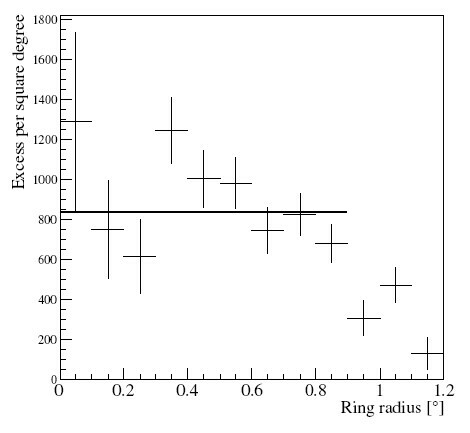 2: Radial profile of the gamma-ray excess, relative to the position of Westerlund 1 (white star in Fig. 1). Preliminary H.E.S.S. data. Fig. 3: H.E.S.S. significance contours overplotted on a map of HI density at the approximate distance of Westerlund 1 (HI data from McClure-Griffiths et al, 2005). Preliminary H.E.S.S. data.